Preserve and Trail Information: The property adjoins 8.5 acres of preserved land along the Stony Brook owned by Princeton Township, and another ~14 acre block of preserved forest owned and maintained by the Princeton School Board. 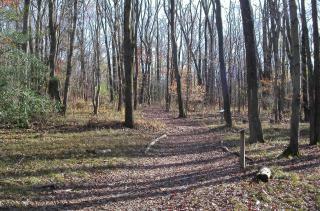 The preserve’s mature hardwood forest supports many woodland plants and wildlife. D&R Greenway is constructing a deer exclosure fence as a demonstration of how forest succession and regeneration would proceed in this area without excessive deer browsing. In addition, D&R Greenway is planting a native pollinator meadow on the property to support native flowering plants and pollinators, like butterflies and bees. History: The property was preserved in 2002 through a partnership between D&R Greenway Land Trust, the Friends of Princeton Open Space, Inc, the State of New Jersey Department of Environmental Protection and Mercer County. The J. Seward Johnson, Sr. Charitable Trust provided a generous donation to create and maintain the preserve. Directions: From Route 206, turn on Elm Road and take a left on Rosedale Rd. Look for the D&R Greenway Land Trust sign on your left. Parking is available at the Johnson Education Center, or at Greenway Meadows, ~500 ft further down Rosedale on your left. The trailhead is directly across the road from the Johnson Education Center. Use caution crossing Rosedale, as there is no crosswalk.